Apple Z is a smoking hot, multi-award winning, non-stop, dance party and show. 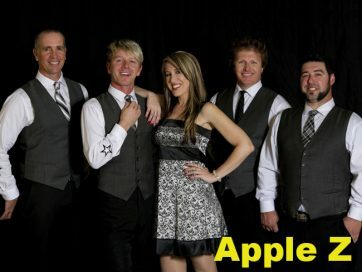 Apple Z has earned its reputation as one of Northern California’s Best in demand dance variety bands for Special Events of all kinds that will leave your Party Guests begging for more and making You a world-class HERO that night! Custom designed with your vision and musical preferences, an Apple Z show is just for YOU! Apple Z offers options including: acoustic ceremony and cocktail music, a DJ after party or the band performing with 4 or 5 pieces including adding their phenomenal Female Vocalist to their package if you so desire. Apple Z has the synergistic chemistry that translates into fresh onstage exuberance at every single show that's just what you're looking for.